Wake up with the Kidd Kraddick Morning Show and get your day started right. Big Al, Kellie, J-Si and Jenna have all the latest showbiz news, the hottest guests, contests and Lubbock’s Hit Music every weekday morning! Kellie Rasberry was born and raised in SC, but moved to the big city to join Kidd Kraddick in the Morning on May 31, 1994. Kellie had aspirations of becoming an actress, but the owner of a local radio station saw her at a talent convention and thought she had the perfect personality for radio. Let’s see… here is a lil’ bit about me: I was born in Mexico City and made a living by selling Chiclets. I pretty much made a killin’ with a whopping $487.75 a year. I was kicked off my corner by a much bigger and stronger kid, so I gave up selling Chiclets. 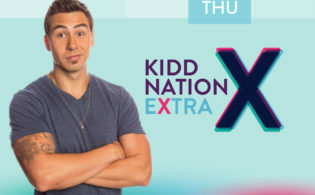 While voicing live advertisements for his limo service during “The Kidd Kraddick Morning Show,” Kidd recognized that Big Al had a unique talent and he began including him in morning show bits. The rest, as they say, is history! Well, I grew up in the good old Midwest and apparently can’t shake my accent. I prefer to blame this on all my Chicago native girlfriends. Growing up an only child has made me fiercely independent and majorly stubborn. I always begged for siblings and finally got 2 when my dad remarried!